A motorcycle frame includes the head tube that holds the front fork and allows it to pivot. 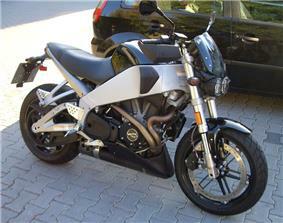 Some motorcycles include the engine as a load-bearing, stressed member. The rear suspension is an integral component in the design. Traditionally frames were steel, but titanium, aluminium, magnesium, and carbon-fibre, along with composites of these materials, are now used. 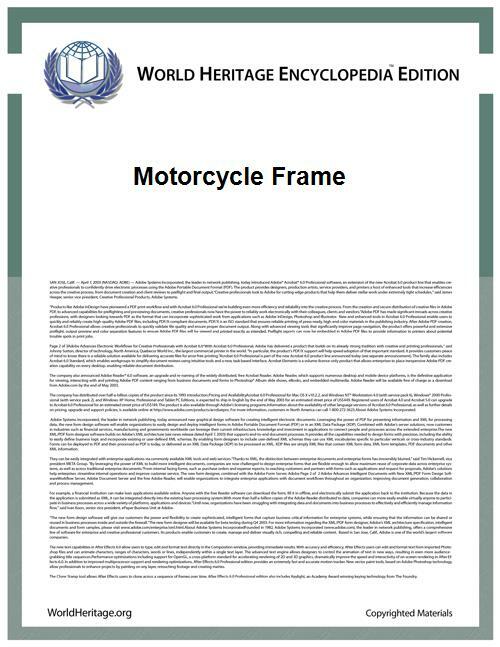 Because of different motorcycles' varying needs of cost, complexity, weight distribution, stiffness, power output and speed, there is no single ideal frame design. The motorcycle engine is held in place within a pair of separate cradles. 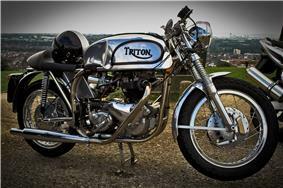 The Norton Featherbed frame was the classic example, but many "duplex" frames actually have a single spine beneath the tank. Two beams wrap around the engine to joint the steering head and swing arm in the shortest distance possible for better rigidity. Beams are usually made of pressed metal (steel/aluminium). The trellis frame employs the same concept but uses welded members to form a trellis instead of pressed metal. Twin beams join headstock to swingarm pivot in as straight and short a line as possible. A beam frame can be very similar to the perimeter frame. The frame is pressed or stamped from sheet metal to form a car-type semi-monocoque. The frame may be entirely pressed (Ariel Arrow), or may have just a pressed aft section connected to the steering head by a conventional steel tubular spine (Honda Super Cub). 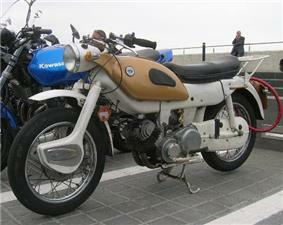 Both the Super Cub and the Arrow also have pressed steel forks, instead of conventional telescopic forks. Supports structural load using the external skin of the frame. 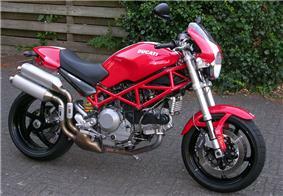 Steel trellis frame (red) on a Ducati Monster 1000. The engine is a stressed member. A trellis frame connects the steering head to the swingarm pivot as directly as possible using metal tube arranged in triangulated reinforcement. Using lattice girder principles, a trellis frame is typically constructed of round or oval section metal tubular segments that are welded or brazed together. 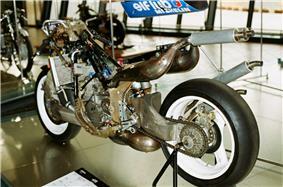 Some motorcycles, such as the Yamaha TRX850, have hybrid frames that employ alloy castings at the swingarm pivot area. A trellis frame should provide a strong, lightweight structure that simplifies placement of engine & components, and gives good maintenance access. Although construction of a trellis frame needs a more complicated process than, say, an alloy beam frame, it requires only a simple jig and a competent welder. No heavy capital outlay is required, so a trellis frame is ideal for a model that may be made in relatively small numbers, and for this reason, the trellis frame option has found favour with European manufacturers. For rider comfort, a motorcycle's engine can be mounted on rubber bushings to isolate vibration from the rest of the machine. This strategy means the engine contributes little to frame stiffness, and absorbing rather than dissipating vibration can lead to stress damage to the frame, exhaust pipes, and other parts. Instead, if the engine is rigidly mounted to the frame, vibrations pass to and are dissipated via the whole frame, and the rider. Rigid mounting allows the engine to contribute to the overall stiffness of the frame. It also becomes possible to mount the swingarm directly to the engine rather than the frame, avoiding the need for frame members extending downward to the swingarm pivot. By increasing the number of mounting points between the engine and frame, vibrations and stress can be better dissipated in the frame, typically creating a triangle between the swingarm in the rear, the cylinder head at the top and the lower crankcase area at the front. If a rigidly mounted engine not only contributes to, but is critical to, the stiffness of the frame, and is an integral part of closing the triangle or trellis structure that transfers force from the headstock to the swingarm, to the point that without the engine the frame would be deformed, the engine is called a stressed member, or a lifted engine. Sharing the load between the engine and frame reduces the overall weight of the motorcycle. 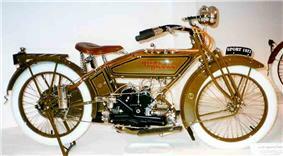 Stressed member engines were pioneered at least as early as the 1916 Harley-Davidson 8-valve racer, and incorporated in the production Harley-Davidson Model W by 1919. This was called a keystone, or diamond, frame. The 1946 Vincent Series B Rapide was designed with an advanced chassis, termed a "tour de force for its day," that included a stressed member engine. During early testing of the 1983 Kawasaki GPZ900R, twin downtubes were included, creating a full cradle, but the downtubes were found to carry little load, so they were removed, relying entirely on the combination of the steel backbone and engine for chassis rigidity. BMW's R1100 series twins of 1994 relieved the frame of stress entirely, with the engine carrying the total load from the front Telelever fork to the rear Monolever. 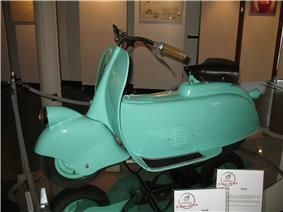 ^ "1963 Ariel Leader". Retrieved 2008-11-24. ^ Rafferty, Tod (2001). Illustrated Directory of Harley-Davidson Motorcycles. MotorBooks International. pp. 59, 64–67.